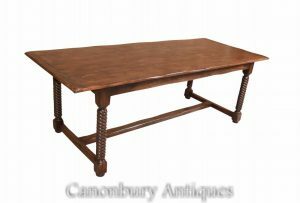 – Great for hosting large scale dinner parties as this extends to 170 inches (431 CM) when fully open, that is 14 feet! 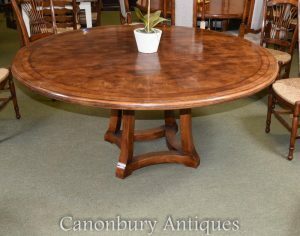 Superb Victorian Walnut and Marquetry Centre Table. 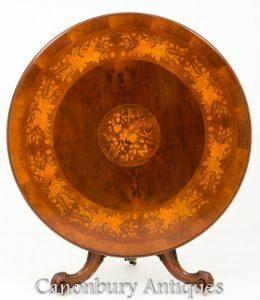 The top having wonderful stylised Marquetry inlays. The base having swept carved legs and a turned carved column and original gilt brass fittings. 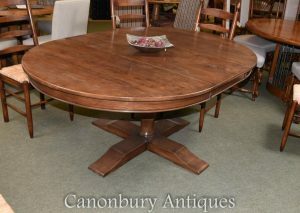 William IV Mahogany 3 Leaf Extending Dining Table. Standing on Original brass castors with turned, carved and Fluted legs. The top having 3 extra leaves and thumb mouldings. 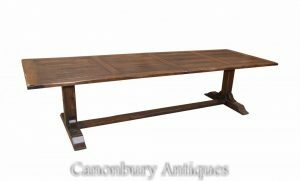 Will seat 8 – 10 people making this a very versatile table, either for a small dinner party or a larger celebration. 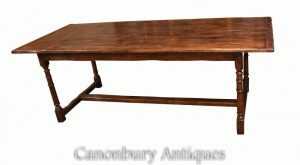 Mahogany Regency Style Dining Table. Standing on fluted swept legs with original brass claw castors and gun barrell turned columns. 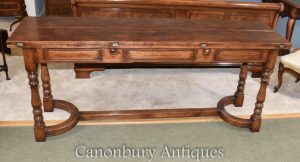 The top being of solid Mahogany with matched timbers and a multi reeded molding. This table comes with 2 extra leaves and will seat up to 12 people.